Is law justice to women? Homicide is the general term used to cover the different changes involved when one human being kills another. Murder is one type of homicide and is distinguishable from the others in that it is necessary to prove the intention to kill or seriously injure. A killing with such intention can sometimes be justified. For instance those who kill in self defence using reasonable force will be acquitted. Intentional killing may also be excusable if it was a response to provocation. This will reduce a murder charge to voluntary manslaughter thus avoiding a life sentence. In this essay I will examine why women's physical and emotional characteristics may prevent them satisfying the test for provocation and why "mans...laughter" is so aptly named. In order to prove provocation a provocative conduct, loss of control and that a reasonable person would have lost control as the defendant did must be proved. 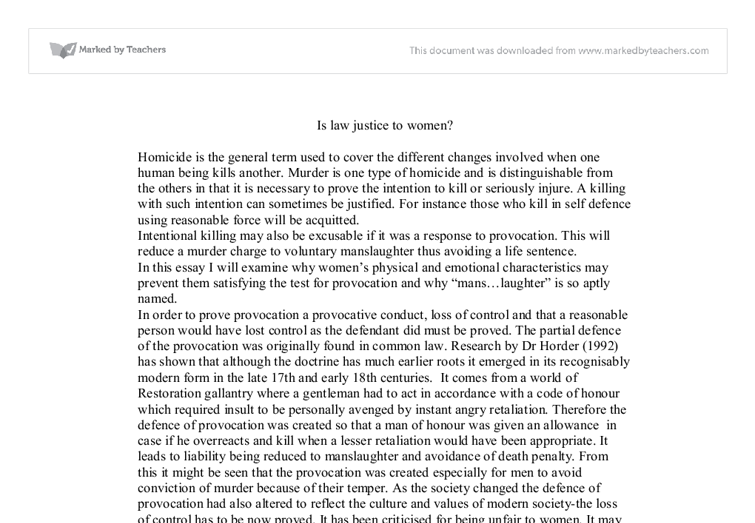 The partial defence of the provocation was originally found in common law. Research by Dr Horder (1992) has shown that although the doctrine has much earlier roots it emerged in its recognisably modern form in the late 17th and early 18th centuries. It comes from a world of Restoration gallantry where a gentleman had to act in accordance with a code of honour which required insult to be personally avenged by instant angry retaliation. Therefore the defence of provocation was created so that a man of honour was given an allowance in case if he overreacts and kill when a lesser retaliation would have been appropriate. ...read more. Helena Kennedy in Eve Was Framed: Women And British Justice said that women experience "a snapping in slow motion, the final surrender of frayed elastic". Lord Chief Justice, Lord Lane has said that "sometimes there is not a time for cooling down but a time for realising what happened and heating up". As a result the courts are beginning to acknowledge that men and women may react differently when provoked. In Ahluwalia case in her final appeal she was eventually granted on the grounds of the diminished responsibility. In Thornton's appeal the concept of "battered women syndrome" was taken into account when deciding whether there was sudden or temporary loss of control. Another successful appellant was Emma Humpreys where she was taunted by her boyfriend about her attention seeking behaviour and inability to cut her wrists properly. She then snapped and turned the knife on him. In this case the jury were told to use the concept of cumulative effects of years of abuse meaning taking into account previous provocations when deciding whether or not she actually lost control at the time of killing. However despite the success of these cases the judge ordered the jury to consider only the final provoking case of Diana Butler. She stabbed her abusive husband during a row. She was convicted with murder and only released on bail after successfully appealing in 1999 on the grounds of diminished responsibility. Susan Edwards a researcher and campaigner has demonstrated the significant difference in the way men and women kill. ...read more. Therefore it would be available for battered women who kill their abusive partner when he was asleep for instance. Secondly, it would be no longer required to prove sudden loss of control which would make it easier for women. However it might provide "licence to kill" and even excuse revenge killings. In the cases where jealousy, revenge, preservation of family's honour or victim infidelity involved the defence would never be available. Another area where law seem to be unjust is in the cases where a battered woman kill her partner in order to protect herself from further violence. She is not able to use any of the defences to murder and therefore will be given a life sentence which seems unfair. Campaigners have proposed that there should be a new partial defence of self preservation. The proposed defence would show that the woman's act was wrong and disapproved by the society and the defendant would only benefit from a partial defence. Before killing the defendant must have been the subject of repeated serious violence. It must be proved that the offender was in a state of severe emotional disturbance(includes fear and anger). The defendant must have had a strong belief that killing was the only was to stop violence. This new defence would look at how woman react which would be more justice than using the defence of provocation which is designed for men. The law on provocation is not fair to women. It doesn't take into account the differences between men and women. It ignores the fact that women are physically and emotionally different from men. ...read more. So those who attempt murder could be as potentially dangerous as those who murder, yet the sentences are both different, which is unfair as the point of the law is to protect the public from potentially dangerous criminals and from harm. This allows those who want to clear their name and get immediate compensation at a lower cost to do so. States that have not taken part of the ICC cannot be trialled in that Court. to take the vehicle onto a public road. Marchant was stopped when the victim on a motorbike approached at high speed and collided with the tynes. He suffered catastrophic injuries and died, but neither of the defendants were convicted because "even had such a guard had been in place, it would not have prevented the collision. This was because the defendant?s ordinary mental faculties of reason, memory and understanding had been affected so his condition came within the rules on insanity. It could just have easily been decided in this case that the defect of reason had to be caused by a mental disease, as it was in M?Naghten. 14 CB 357 (Huxley-Binns & Martin, 2008). An example of a case is Re Sigsworth (1935) Ch 89. 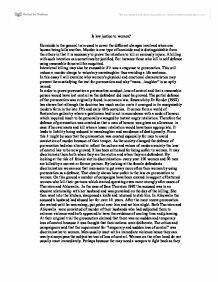 In this case, a son murdered his mother and her next of kin was supposed to inherit according to the set rules enacted in the Administration of Justice Act 1925.
to inflict bodily injury on or to terrorize the victim or another; or to interfere with the performance of any governmental or political function. Kidnapping is one of the few crimes that are investigated by the federal government. Federal authority is based on the assumption that the victim will be taken across state boundaries.